She is 26 and wants Colombian women to wake up. Eyra Baquero is the new Miss Progress International. The show, broadcasted live worldwide, was followed by tens of thousands of spectators. 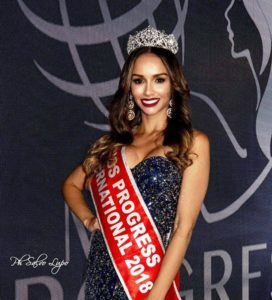 LEPORANO – The most awaited moment of the sixth edition of Miss Progress International-Women for Progress has meant that the world knew the name of the one who, for a year, will be the symbol of the only event in the world dedicated to the environment, health and human rights. After Arantza Barba (Bolivia, 2014) and Liz Arévalos (Paraguay, 2015) to win was another South American. Last Friday, Eyra, a splendid 26-year-old from Colombia, has been awarded by Giuseppe Borrillo, director of the competition and by Giusy Nobile, president of the cultural association in Progress, creator of the event. Jedaver Pancho Opingo, Miss Progress International 2017, placed the crown on her head. The evening show was broadcasted live from the Muscettola Castle of Leporano, in streaming and on the channels of Studio 100 TV and conducted by Giuseppe Borrillo and Bethany Cammack. The visualizations and interactions on the official page have surpassed the wall of sixty thousands. The triumphant start in the name of cultural integration has seen the contestants getting on the scene wearing their glittering traditional costumes and the one worn by the Mexican Brenda Velasquez Haro has been awarded as the most beautiful. The Kenyan Audrey Awuor, which has obtained over nine thousand preferences, has been awarded of the title for the most popular on the web. The melodies performed by the talented violin player Francesco Greco have accompanied the reading of the projects of all the competitors and, to further enrich the show, there were the Dejanira Ballet dancers and the classical Neapolitan arias interpreted by the famous soprano Angela Massafra, accompanied to the piano by Alessandra Corbelli. The other awards went to Natali Guerrero (Guatemala) for cultural integration, Sarah Bona (Philippines) for her environmental project, Hannah Higgins (United Kingdom) for health, and Eyra Baquero for human rights . The Sunday departures closed the curtain on ten days spent in the name of culture, social integration and progress, with the aim of contributing to making the world a better place.